Explanation: Sixteen years ago, Comet Hale-Bopp rounded the Sun and offered a dazzling spectacle in planet Earth's night. 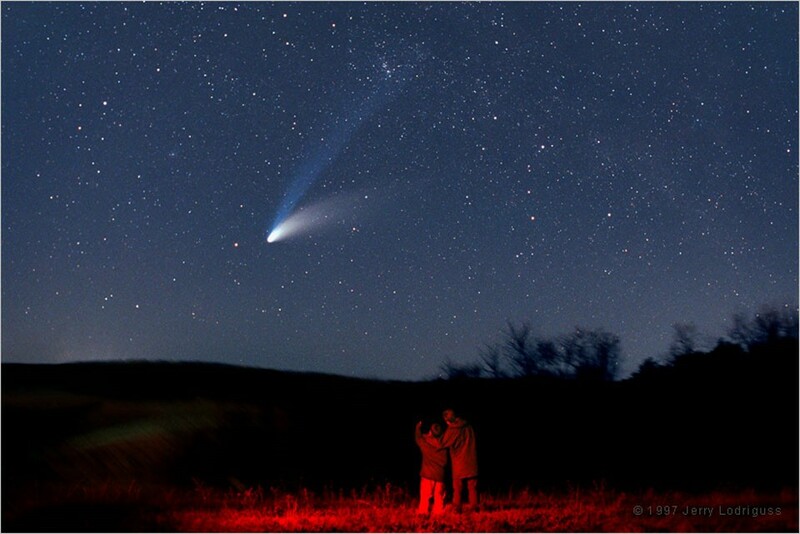 This stunning view, recorded shortly after the comet's 1997 perihelion passage, features the memorable tails of Hale-Bopp -- a whitish dust tail and blue ion tail. Here, the ion tail extends well over ten degrees across the northern sky, fading near the double star clusters in Perseus, while the head of the comet lies near Almach, a bright star in the constellation Andromeda. Do you remember Hale-Bopp? The photographer's sons do, pictured in the foreground at ages 12 and 15. In all, Hale-Bopp was reported as visible to the naked eye from roughly late May 1996 through September 1997. Currently, sky enthusiasts await Comet ISON's continued brightening in the coming weeks, unsure how interesting its first journey to the inner Solar System will be.